A soft-glowing bed of fast-growing moss sleeps soundly on this otherwordly base. The strangely-glowing shards radiate warmth into the dirt. This warmth is used in accelerating the growth rate of flora that comes in contact with the base. 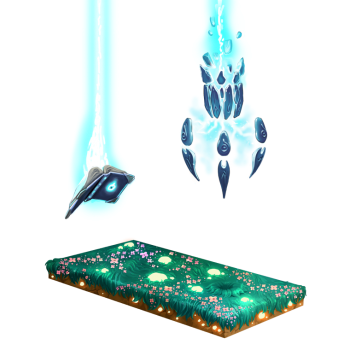 The Living Base will increase petal and herb drops from mice in the Living Garden, Lost City, Sand Dunes, and their twisted counterparts! The Living Base can be purchased from the Gnawnia Rift Trapsmith. It costs 899,000 gold, 10 Riftgrass, 10 Rift Dust, 10 Magic Seed, 24 Magic Essence, 12 Aleth Essence, 4 Ber Essence, 2 Cynd Essence and 1 Dol Essence. It cannot be refunded. The Living Base doubles the range of petals and herbs dropped (rather than the drops themselves) in the six Living Garden areas. Therefore, if a mouse can normally drop 1 -3 loot, it will drop between 2 and 6 (odd numbers included) with the base. Hothouse Base - An event-only base with the same special effect. 18 May 2016: The Living Base was introduced, coinciding with the release of Furoma Rift. This page was last edited on 14 January 2019, at 13:37.